The MPAA(Mobile Phone Abusers Anonymous) was a project that grew from my MA project at Ravensbourne in 2004- 2005. I started a fellowship of people to bring together their hopes, strengths and experiences to solve their common problem: addiction to the mobile phone. The project manifested in several prototype phones (Catcus Phone, Tru:th, Phish Phone) addressing common issues and a public performance (Town Crier) that tried to address the ideas of embodying two spaces in public environments. Some prototypes below, and the brochure for recruitment. N.B.This was two years before the iPhone came out. MPAA was exhibited at TAKEAWAY, the Festival of Do-it-yourself Media at the Dana Centre in London in 2006. 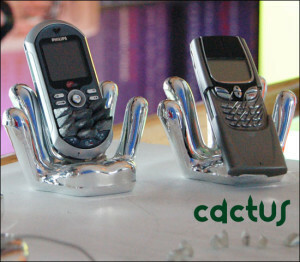 The Cactus phone (two models seen here) promises to deliver maximum pain for all your communication needs. Calls can become more meaningful when the other knows you are enduring physical pain to talk to them. The Tru:th Phone is modified so the call button only works if one is intoxicated. 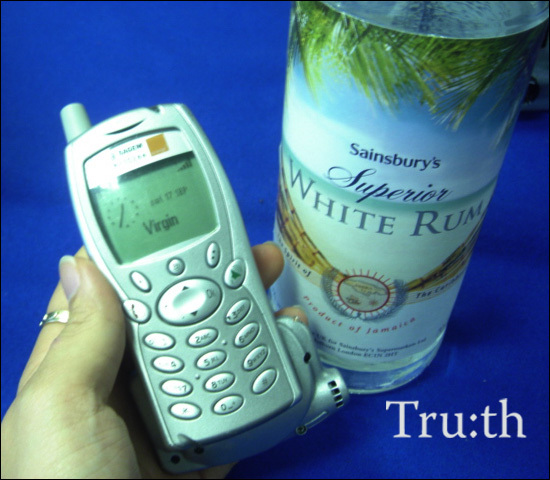 Tru:th tries to over come the distance of mobile calls, creating honest emotional communication. The Town Crier, equipped with microphone/camera, transmits overheard mobile phone conversations in public spaces through a ghetto blaster. The Crier picks conversations in communal spaces such as parks to question the idea of inhabiting two spaces at once, and the effect on others who share our physical space.